This is the taste that I love from long green eggplant. First it is sweet and then salted beans mix in and the intensive aroma of sweet basil. This dish could be also made without pork meat or the sauces but there have to be garlic, chili, salted beans and sweet basil to make the perfect taste. Note 1: When cutting the long green eggplants, be careful not to cut them in too thin pieces, because they will turn soggy later and make sure the pieces are equal in size so that all is cooked equally. Note 2: Some people steam the eggplant first to make sure all the pieces are cooked before stir-frying them. If you do steam them first, there is no need to add water and cover the wok like I did. You can just fry them and season and done. Make the frying paste by adding Garlic and Hot Chili in Mortar and beat into coarse paste. Fry the paste in Veg. Oil until you smell the garlic and Chili in frying then add the mince pork. Season with salted Bean and add lime leave and stir the fry well. 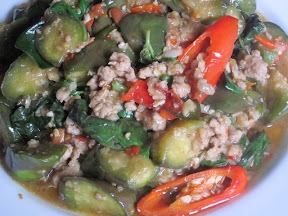 Add the cut pieces of green eggplant and continue frying, add half a cup of water and stir well, and close the cover. After 3 minutes open the cover and turn the fry over, so all the pieces get to cook equally. After the pieces are 80% cooked we can start seasoning with oyster sauce and soya sauce. 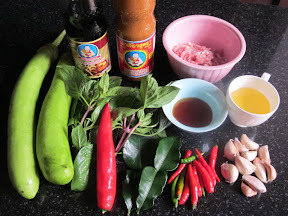 Then add the slices of Red Spur Chili and Sweet Basil and stir them together. Note: After eating this fry, I sweat up to my head. It was not the chili hot, but I think it is the mixture of the paste and Basil, which is really good for me at the moment because I am trying to get rid of the cold.